The Web Guys are also your Internet consultants, so it is our job to stay current on all online changes and trends so you don’t have to. Remember, if anyone ever offers you an online service and you’d like to hear our thoughts, we do this for you at no charge. Make sure to take us up on it, as it is sure to save you money! This is the first in our series of useful Internet Marketing communications. From now on, expect to see at least one from us every month! If you have a topic that you’d like us to write about next month, feel free to email us a suggestion. Google recently launched a re-branding effort focused heavily on local search and local advertising. Maybe you are one of the many small businesses receiving phone calls about the new features Google is offering: Google Tags & Google Boost. Google Tags & Google Boost are paid features you can add to your account to further utilize your Google Places listing. Do The Web Guys Recommend Google Tags or Google Boost? They aren’t detrimental, by any means, but no, we don’t believe either service is going to make you a whole bunch of money. Google Tags and Google Boost require additional cost and offer no Search Engine Marketing benefit. If you are interested in investing in a PPC (Pay Per Click) strategy, we believe that a Google AdWords account is superior to a Google Boost account. Please Contact Us at 317-805-4933 if you have any questions or want to know any further information about these or any other services. Google Tags add an extra line of real estate to your Google Places listing with a custom message that can make your business stand out. This is similar to having a bold listing in the Yellow pages. Tags are yellow markers that allow business owners to promote important aspects of their business. For example, a tag can highlight a coupon for new customers, a link to a contact page, or a discount for a new service a company is now providing. Tags seem to work like traditional attention grabbers, but once everyone else catches on, the affect will be lost. If all listings include tags, this service will no longer be an affective web design strategy. Tags DO NOT affect search result ranking, they simply add more information to your Google Maps listing when it appears in search results. COST: There is a $25.00 per month flat flat fee from Google to add a tag to your listing. There is always the possibility that some potential customers might actually get “turned off” by sponsored listing which might counteract any positive impacts tags may bring. 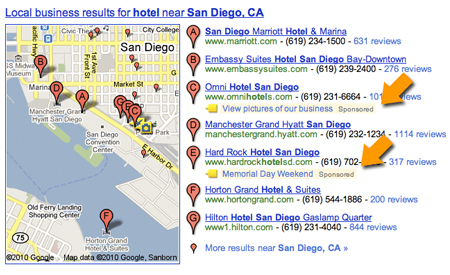 Google Boost enables business owners to create online search ads directly from their Google Maps account. Google Boost ads appear in the “Sponsored Links” section of Google.com and Google Maps search result pages. When a map appears along side the results, a blue pin will help people quickly find their location on the map. 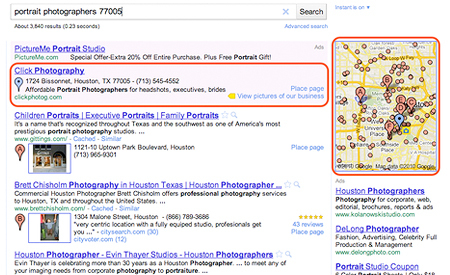 We circled the Google Boost listing, below in red, to make it easier for you to identify it. THIS IS NOT HOW IT APPEARS IN THE SEARCH RESULTS! COST: Google Boost requires a monthly budget with a $50 minimum. The amount of money you pay to ensure your ads are served up to potential customers depends on the keywords you want to be found for. The cost of each keyword will be determined by the competitive nature of your business in your location. Note: Your business only pays when someone clicks on your ad. Keep in mind the more people you have bidding for your keyword in your location, the more money you will be required to spend to have your ad served up to potential customers. When you move to a pay-per-click model like Google Boost, you can track the number of clicks your ad is receiving, but there is no way of knowing if those clicks converted into sales. Google Boost can be a rather costly addition to your search marketing services with results that can be difficult to track. To learn more about Google Boost, Google Tags, or any aspect of internet marketing, call The Web Guys Phone Number at (317) 805 – 4933.